BYRON Shire Mayor Simon Richardson has moved to reassure Bangalow residents and commercial landholders over changes mooted for the town’s Development Control Plan. Concerns about the change process surfaced after a rowdy Bangalow DCP Workshop meeting last week. Several local residents contacted the BSN complaining that they felt shut out of a meeting in favour of commercial interests. Likewise, local commercial landholders expressed frustration at the meeting itself over a submission by the local Design Advisory Panel (DAP). “Residents and other stakeholders will have ample opportunity to have input,” said Cr Richardson. “This is just the first of a series of community consultations we are planning over the rest of the year. Cr Richardson said that council staff had been very impressed by the DAP submission and convened a meeting with local commercial owners. The DAP is a group of expert local architects, engineers, designers and town planners who offer commentary and advice on local developments. “We met to discuss their very worthwhile contribution to the process,” said Cr Richardson. The council has also appointed an extra planning officer to supervise the formulation of the new DIP. “Anyone with concerns or input to the process is welcome to call council to put their case,” he said. Pursuant to Section 79C(1)(b) of the Environmental Planning and Assessment Act 1979 the proposed bulk and scale of the building is likely to have a negative impact on the built environment of the locality. 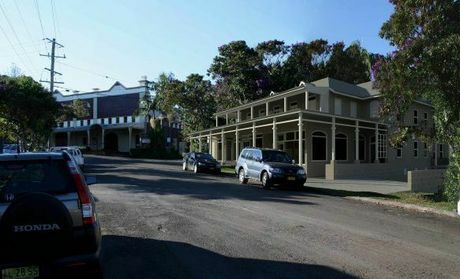 Pursuant to Section 79C(1)(a)(i) of the Environmental Planning and Assessment Act 1979 the proposed development is likely to detract from the character and appearance of the Bangalow Heritage Precinct (item of the environmental heritage) identified within Schedule 2 of Byron Local Environmental Plan 1988. Pursuant to Section 79C(1)(a)(iii) of the Environmental Planning and Assessment Act 1979, the proposal is inconsistent with the provisions of Byron Development Control Plan 2010, Chapter 12. Pursuant to Section 79C(1)(c) of the Environmental Planning and Assessment Act 1979 the subject site is not considered to be suitable for the proposed development. Pursuant to the provisions of Section 79C(1)(e) of the Environmental Planning and Assessment Act 1979, the built form and environmental impacts of the proposed development are considered to be contrary to the public interest. Inadequate vehicular access in Station Lane, including lines of sight, turning capacity, delivery access and insufficient lane width at 5.5 metres. The height of the building is above future 2014 LEP standards. The motion (Richardson/Cameron) was put to the vote and declared carried. Crs Ibrahim, Dey, Richardson, Cameron and Spooner voted in favour of the motion. Crs Cubis, Woods, Wanchap and Hunter voted against the motion.